Not enough for a side dish but enough for me! Nice beans. This year I haven’t put any in the ground- yet. How long ago did you plant them? I have about 6 plants in a container. Mine were ‘Kentucky wonders’, same seeds left over from last year. Do you know what variety you planted? I picked my first ‘batch’, but there are flowers on the vines again so there should be more coming. I think string beans are a good thing to grow, They seem pretty productive, but from what I read birds like to get at them too. I just need to plant a lot more of them to get the quantity harvested up. This morning I took my daily ‘tour of the grounds’. My new bamboo shoot is growing fast. So are my weeds. I think I am going to pass the lawn mower over my wild area. My red clover has been flowering for a while so they should have spread their seeds around by now. I am thinking of buying a pound of either buckwheat or oat seeds as my next cover crop. The red clover should come back by itself again. Gee, it sounds like I am planting acres out back, but it’s more like square feet. Yet another reason to keep that gardening journal (which I am definitely going to do for next season – and prob. before). So, I don’t remember when the beans went in the ground, but they did start from seed. I think it was roughly about six weeks ago. The plants themselves don’t seem that great. The leaves have a little blight on them; a few have some brown around the edges. 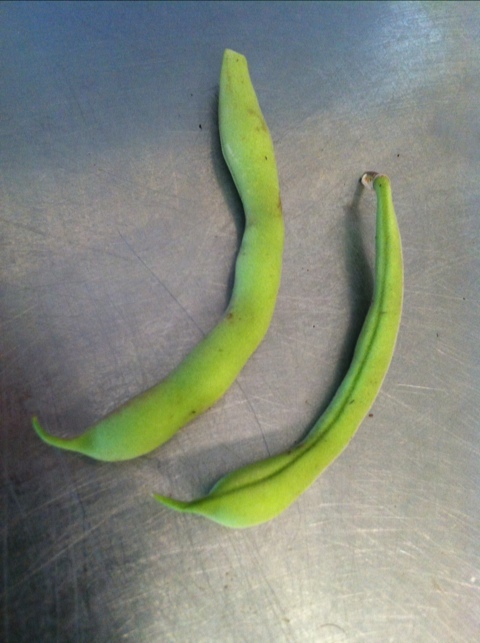 The beans themselves, though, are coming in okay. There were two more (full size) on the same plant just two days after I picked the other ones – another reminder to pick pick pick to up production (which is something that I sometimes fail to do – partly forgetting and sometimes just time constraints). The seeds were from the Johnny Appleseed catalog. My friend/neighbor/sometimes co-gardener had extra so we threw them in the ground to see what would happen. We planted them right next to a self-watering container with the same seeds at the same time. Interestingly, those are not yet producing anything. Not sure if they will …. will keep you posted. Are you gardening both in back and in front? Any concerns about eating veggies grown close to the street?